"Beautiful city... 'tis a shame there's a mad god on the throne." Walled Yes. Stone curtain wall. Ipotal is a marvel of city-planning, advanced architecture and sculpted aesthetics. This magnificent city has large market plazas, terraced gardens, monuments, vast amphitheatres and universities. The main gate of the city faces the ocean. The main harbor is actually walled which protects it from invading ships. The harbor is the heart of the city and the buildings of this great city are built in a great horseshoe shape around it. A huge gate, known as the Sea Gate, effectively seals off the harbor in times of war or severe weather. 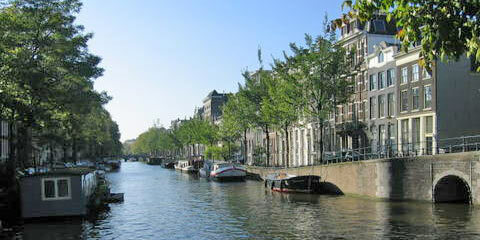 The city is riddled with a network of deep canals that allow water traffic to penetrate deep into the city. Some of these waterway are quite wide and can accommodate large ocean-going vessels. Where large canals converge, there are small man-made lakes within the city. Most canals, however, are designed for smaller "city boats". Dozens of bridges span the canals and most buildings are within a stone's throw of lapping water. These canals form a network of waterways that all connect to the harbor eventually. Most business are on the water... most buildings have "boat houses". Barges, longboats and ships move about the city via this network of canals. Goods and people are ferried to and fro. The city's sewer system is connected directly to the canal network. This has effectively solved Ipotal's refuse and waste problem. The citizens of Anquar are down to earth realists. Practical, level headed. Anquarans, both men and women, tend to be gregarious and outspoken. It is the fashion here that men are clean shaven. Men tend to have short, curly sandy colored hair and green eyes. Women have long wavy hair. Green eyes are common in both sexes. Men tend to have strong jawlines and hawkish noses. This region is known for the taruba, a species of bird which is very large, tall and brightly feathered. The taruba is a flightless bird about 1.5 meters tall (5 ft). It has brilliant blue and green plumage and an immense tail which fans out in a breathtaking iridescent display. The taruba is the national bird of Anquar. Several hundred tarubas can be found in the capital city. It is illegal to harm one on pain of death. Many are wild, but others are domesticated and treated as pets of the cities. The main government building and royal residence are one in the same. It is a gargantuan fortress at the heart of the city. The dominating feature of this stronghold is a central tower that rises 252 meters (826 ft) into the air and gives the building its name. The Trade and Tariff Hall oversees all taxation and trade tariffs in the nation. It is an important component of the Anquaran government due to the crushing taxes imposed by the King. High ranking officers of this branch of the government are known as Tax Lords and wield considerable influence as they can adjust taxes at will. The market square of Ipotal is found where two broad canals meet. They form a large square man-made lake and at the center of this is a large square stone island. This island is the main market and four lesser market squares are found on the corners. All but the largest ships can make their way here. This is the main city fortress and home to the Black Guard military. Because of its height and dark bricks, it is often referred to as the "Black Guard Tower" or more simply the "Black Tower". The bricks are dark because of a very high lead content. The tower was built upon a former lead refinery and antimony mine. Caves riddle the hill that the tower sits on. These caves were the former mine shafts and the ground there is laced with lead. Furthermore, the bricks used in the construction of the tower were also infused with lead. This makes the walls of the tower opaque to magic. Magical energy cannot penetrate these bricks. Several other important buildings in Ipotal utilize these magic blocking, lead-lined bricks. The Black Tower is home to several legions of the Black Guard including heavy cavalry, archers and war chariots. division of war chariots. There is no distinction between the army and the city guard. The nation's soldiers patrol the city streets of Ipotal. A tall stone keep formed from four circular towers and a larger central tower. Run by a small brotherhood of scholar priests. A huge state funded playhouse which frequently hosts elaborate productions and plays. Only "state authorized" plays are allowed and each production undergoes scrutiny. Historical dramas are closely monitored and always portray Dalmoran in a favorable light. Usually, Dalmoran is depicted as a benevolent god saving the Kingdom from wrathful and power crazed half-gods of long ago. Comprised of 57 separate craft schools each teaching students in the skills for a single dedicated craft. There is a craft school for stone masons, carpentry, etc. These craft schools give Master Certificates upon completion of the curriculum. The city of Ipotal is patrolled by the same soldiers that fight Anquar's wars and patrol the country side... the Black Guard. These men are well equipped and trained. Units of troopers, enforcers and juggernauts patrol the city streets and keep the peace. The Anquaran navy has forty ships based out of Ipotal. The flagship of the Anquaran fleet is the Scimitar. A special detachment of the navy patrols the canals networks with 50 "canal runners" - long rowboats that special six man Black Guard units. There is a huge underground movement which directly opposes the rule of King Dalmoran and his armies. This massive resistance group operates in secret. It is divided up into "cells" - small subgroups which limit contact to other cells to prevent the government from learning too much about them. Members of the Resistance move about constantly, changing meeting locations and working with those sympathetic to their cause. The total numbers of the Resistance is impossible to say, but it is estimated to be in the thousands. The Blood Lords are a large and well organized guild of thieves, cutthroats, assassins, smugglers and bandits. They care little for the politics of the kingdom and have found great profit in smuggling and other black market operations amidst the climate of fear and oppression the current reigning demi-god has created. They neither support nor oppose the Resistance or the King and seem content to find profit in the struggle between those two. A secretive order of scholars, wizards and others who unite in common purpose to restore the Age of Peace and Reason that Karnus created ages ago. They are trying to find the missing pieces of the Talisman. They also work on ways to overcome the magic of the Talisman and resist the power of Dalmoran's pieces. They are very secretive and dabble in powerful magic. They are an informal ally of the Resistance and sometimes work with the Resistance. A small thieves guild that operates mainly in the sewers and other subterranean chambers. They use their canals to make escapes underwater, etc. This group has about 200 members. It is completely independent and allied with no other group. Still under construction. Has been under construction for 27 years. Will probably take 50 years total. It is immense. Truly, the largest building in the nation, or it will be. A statue of King Dalmoran. Over 60 meters tall (196 ft) and fashioned of stone. Being built along side the Great Temple of Anquar. An arrangement of huge gardens, parks, walkways, gazebos and fountains. Although tended to in the daytime, the city guards leave it be at night and it is considered a dangerous place when the sun goes down. This garden is a gift from King Dalmoran to the people. Hindol Square is considered by many to be the heart of the city. This beautiful rectangular open courtyard lies near the palace. It is a broad expanse of colored stone tiles which form the national symbol. The Hindol Square is one of the most beautiful parts of Ipotal. This square is the place of the infamous Hindol Massacre in which 1400 people were put to death in the final days of the civil war just prior to Dalmoran taking the throne. A huge iron gate that can be opened or closed to seal off the harbor in times of war or severe weather. Although it will effectively prevent any ship from entering the harbor, the lower third of the gate is grated (to allow sea water through) and so it is possible for a swimmer to get through. A small government funded school kept under tight control by the King. This huge grey stone tower looms over the city and houses within it the nation's primary wizardry school and the Guild of Wizards. There are rumors that the powerful elite spellcasters of this tower secretly plot against King Dalmoran. King Dalmoran is a power hungry demi-god, but only through the power of the pieces of a magical Talisman. Through the Talisman’s sorcery, Dalmoran is immortal and the wielder of unspeakable power. Cruel, petty, jealous and paranoid, he is a narcissist of the highest order. He is served by a legion of servants and slaves who are forced to do bidding. He is a megalomaniac who has founded a religion to worship himself. King Dalmoran appears as a slim and healthy middle aged man with sandy blonde hair. Although he is hundreds of years old, he appears no older than 40. King Dalmoran's elite personal guard is known as the Eternal Guard. Each has the title of Knight Commander. There are only six of these knights and they are always with him. They wear a distinctive suit of heavy plate armor forged from a special copper-steel alloy which has a distinct smoky burgundy color. They wear elaborate great helms and billowing cloaks, iron gauntlets and knee high boots. Their great helms have no visors or eye holes, yet always seem to be aware of everything and everyone around them. Due to the fact that they never seem to eat or sleep and never leave the king's side, it is widely rumored that they are not entirely human. Speculation about their true nature ranges all over including magically enhanced humans, aberrants, automatons or even undead. General Kurn is the Lord Marshall, the supreme military commander overseeing all the armies of Anquar. He is a tall and lean man with long black hair, pale skin and a clean shaven face. He wears gleaming blue-black armor and a billowing black cloak with a grey raven pattern. His helm is fashioned from the same blue-black metal and sports wings and a great black feather plume. He is the second highest ranking person in the nation, answering directly to King Dalmoran. Lord Marshall Kurn is a phenomenal physical specimen. He is a skilled warrior who has mastered every weapon and unarmed combat. He is also a brilliant strategist. He fights primarily with a great two handed sword and a great bow. His Holiness Farune is the High Priest of the Church of Anquar. He is responsible for converting all Anquaran citizens to Anquarism. He oversees the ceremonies of the Church of Anquar and has been charged with stamping out the last remnants of Sharmaudism. His Holiness Farune is an obese man with a balding head. His rotund girth is covered in gleaming white robes adorned with jewels and feathers. He walks with a 2.5 meter tall ivory carved stave. During ceremonies and other formal occasions, his head will be crowned by an elaborate head dress which incorporates the symbol of the Talisman in its design. Farune maintains a public persona of grace, humility and piety. However, in private, he is fickle at best, prone to impatience and emotional outbursts. He is known to beat his slaves mercilessly. Chief Magistrate Jameiros is the chief magistrate of the nation and rules over the entire court system, including the High Court in Ipotal. He is instrumental in seeing that the laws of King Dalmoran are obeyed and also grants awards to those who render meritorious service to the crown. King Dalmoran gives Chief Magistrate Jameiros a great degree of freedom in meting out punishments and rewards at his discretion. The Chief Magistrate works closely with General Kurn and, under his iron fist, the city and nation beyond are held in a constant state of military control and fear of the legal system. Chief Magistrate Jamerios is a lanky redheaded man with a full beard, pale skin and piercing blue eyes. He wears the black cap and red robes common to all magistrates in Anquar. Master Verushka is the Guild Master and Head School Master at the Tower of High Wizardry. He is the supreme authority on all magical matters throughout the Kingdom of Anquar and answers directly to King Dalmoran. He is in charge of training the mages of Anquar, but also of maintaining control over the mages. No single individual wizard is allowed to amass too much power lest he be a threat to the supremacy of King Dalmoran. Therefore, Master Verushka maintains a network of contacts, spies and wizards loyal to the crown to monitor all magical activity in the realm. Verushka hand picks wizards for government positions, faculty positions and special missions. Master Verushka is a tall and thin man with a high forehead and a short grey beard. He wears blue robes with gold trim and often uses a monocle to help him read. He has a golden drake as a pet and familiar which is with him at all times. This drake is often coiled about the top of Verushka’s stave. Adoben is a thoroughly evil man. Lord Adoben serves as King Dalmoran's chief of staff, carrying out his orders and overseeing the daily functioning of the Kingdom. Lord Adoben has a taste for quaking herb (kivodal) and is completely addicted. Adoben loves snakes and reptiles of all kind and even collects them. He keeps several in his office and home. He has the image of the snake worked into his weapons, armor, even his home. His cruelty is boundless, exceeded only by his loyalty to his king. A tall, bald and thoroughly ugly man with protruding eyes, sunken cheeks and an intense, almost fanatical gaze. This tall, gangly man wears silver and blue robes and armor. He oversees the Church in all government functions, holds mass, holds council with King Dalmoran and is tended to by a small army of lesser priests. Salrik Tavern - Three great boulders sit out front of this tavern. This large popular tavern is situated at a major crossroads. It is a rough tavern popular with a seedy clientele - commoners, mercenaries, soldiers and lower class merchants can all be found here. The Three Stones Tavern has a common sleeping room, four private rooms and its own stables. The Three Stones is run by Salrik, his wife and four sons. Galleris Brothel - This brothel sits on the waters edge of a canal in an old building which once served as a guild warehouse. Forty girls are employed here. They are led by Lady Galleris, an elderly matron and former prostitute. She fiercely protects her girls against mistreatment. Burkus, a quiet older human, helps out in the stables, with repairs to the building and protecting the girls. He is very much a father figure to them. The establishment gets its name from a large copper bell that hangs at the rear entrance facing the canal. Isabella ven Mira Tavern - Isabella is a heavy set Anquaran woman with a loud laugh that fills her tavern often. She has brilliant green eyes, long golden brown hair and a cheery face. This confident, intelligent woman loves her tavern and takes a great interest in it, the staff and her customers. She likes to greet customers when they come in the door and knows most of them by name. She has a tendency to try to "help" in the kitchen, adding spices to stews and such, driving the cooks to frustration. Isabella is a good contact and knows most of the city. She helps the Resistance when she can, but tries to keep the government out of her tavern as much as possible. Argus Fish and Tackle Shoppe - Run by a very old fisherman named Argus. He's a heavy drinker and loves nothing more than to share a bottle of rum with visitors and customers while telling fishing stories and tall tales. Argus mends fishing nets, designs and creates fishing equipment and repairs small boats. Argus was once a crew member of a large fishing vessel and has many stories. He has sailed as far as Ithria and often tells tales of when his ship landed at Borakar to wait out a storm. Ferngang Ship Yard/Mariners Guild - The Mariner's Court is both shipyard and a mariner's guild. It has one large central building with a huge central courtyard which borders the main harbor of the city. This building is flanked on one side by huge woodworking shops and on the other by a pair of drydocks where entire ships are constructed. The Mariner's Court is the largest privately owned shipyard in the city and has extensive repair and construction facilities. It even has a tavern built into it that has 24 rooms for rent. This tavern is called the White Squall. The Mariner's Court is something of a brotherhood of sailors. All mariners are welcome here... even mariners of other nations. Most sailors in Anquar are members of this guild, even if they don't get to Ipotal that often. An old, abandoned shrine to Semorjon can be found on the grounds. Garlameg Apothecary - Considered by the mages and herbalists of Ipotal to be the best apothecary around. This large stone house sits just outside of town, on a hill, overlooking the city. A number of gardens, crops and greenhouses are scattered about the central house. Once a great ancestral home, this mansion now holds a veritable garden in every room. It is run by an old hedge wizard named Garlameg. He has just about every plant, flower, seed, herb and root under the sun and his prices are reasonable. He also sells a variety of potions, elixirs, tinctures and brewed teas. A number of dogs, cats and other pets continually run about the place. Garlameg has some minor magical skill. Dardun Tavern - This quaint little tavern is built right next to a major canal. The main kitchen window sits right out over the water. This lets them catch fresh fish right in the kitchen with nets and cook them up. A large patio borders the water and gives patrons a pleasant view and summer breeze while they dine. The food here is good fare and reasonably priced. This establishment is run by Dardun, a small man with a timid manner, his wife, an enormous woman with a fiery temper and their daughter, Lumina. This tavern was supposedly purchased from the wealth obtained from the horde of a goblin king whom Dardun supposedly slew long ago. He delights in telling the story to newcomers as it seems the only time in his life he ever showed bravery. It is for that goblin king that the tavern is named. Endrig Library - Run by a scholar with a terrible memory. He has quite a knack for remembering facts from obscure books, but will often forget what day it is, whether or not he has had breakfast, whether he has paid taxes, etc. If not for the pretty young woman, Clara, who helps keep the library running, he would have likely starved to death years ago. This library allows access to scholars, mages and such for a price and also obtains dues from members. Volkamar Tavern/Inn - Run by Volkamar, an ex soldier turned hunter and guide. He leaves running the tavern up to his underlings while he squanders the profits and chases rare game animals around the continent. Volkamar loves nothing more than bringing back an exotic pelt or stuffed animal head and putting it up on the wall. Methula Apothecary - The Black Rose is an apothecary, hospital and market for exotic herbs and potions. It is run by Methula, a striking woman of pale skin and long black hair. She dresses in silver and black robes and adorns herself in jewelry fashioned from bones that she makes herself. Rumors abound that she is some sort of witch and dabbles in dark arts. Methula prepares a wide variety of herbal remedies, poultices and healing draughts. She also sells antidotes, tobaccos, herbs, spices, seeds, flowers and basic foodstuffs. She claims to heal with no magic at all. Regardless of how she does it, she is a skilled healer, but has a brusk bedside manner. Her cure may work, but it might hurt. Uvat Brom Gambling Hall - This huge gambling hall is five stories tall and built around a massive central gaming hall. Dozens of games are held simultaneously under the watchful eye of as many heavily armed guards. Everyone is welcome here as long as their gamble or drink. In addition to food, drink and games, the Green Dragon also has rooms for rent, private conference rooms and a number of personal services including private bathes, massage and slave girl prostitutes. The Hall of the Green Dragon is run by an immensely fat man named Uvat who sweats all the time, no matter the temperature. He wears a great deal of jewelry and considers himself to be quite fashionable. Uvat is arrogant and egotistical and susceptible to flattery.